Full Shine Plastic Machinery (Taiwan) is devoted to the development of multilayer co-extrusion blow molding technology and huge accumulative blow molding technology. Its high speed automatic blow molding machine (FS-65PDDL) by the leading brand “FULL SHINE” is suitable for producing six-layer bottles by co-extrusion. 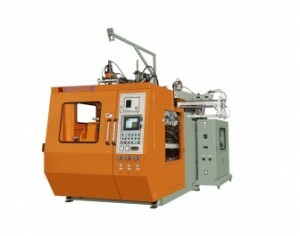 As introduced, its double stations with parallel motion under the control of the linear guide-way are for stable and speedy motion; the YUKEN-Japan servo drive system is energy efficient; all functions with control-on-board design are easy for the operator to modify and change the data on the touch screen; co-extrusion blow molding technology achieves six-layer co-extrusion with barrier feature and equivalent layer combination to obviously extend the product shelf life. Full Shine says this application satisfies the demand from food, medicine, chemical, and automotive industry, which requires barrier features and/or reuses recycled material efficiently. This line includes fully automatic arrangement of blow molding production, such as auto deflashing, inline QC control, In Mold Labeling (IML), waste material auto recycling, and auto material feeding system, adds the company.